Coded very large swaths of this approximately 150,000 page site. Coded all pages, minus the Flash Interactive Travel Guide. Helped create the site map. Heavily involved in site organization, including content presentation. 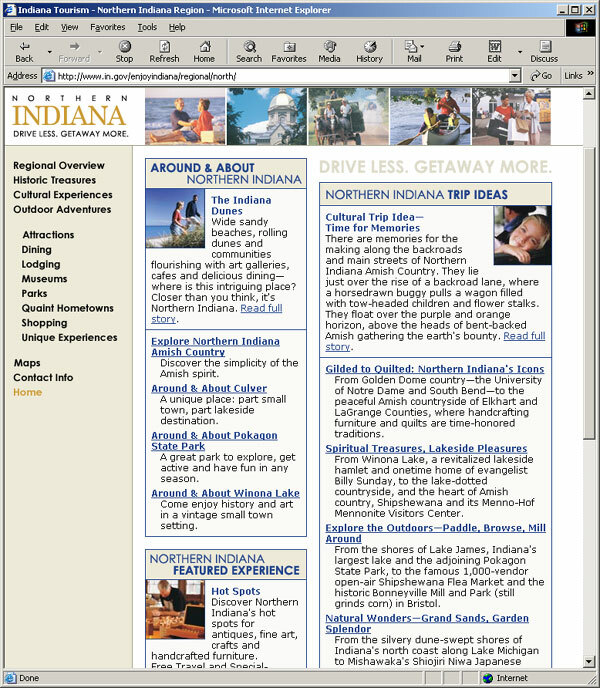 Site is forward and (pretty far) backward compliant with standard browsers. Co-coded site in PHP, including a member’s only area with encrypted passwords, member and sponsor applications with administrative backend, updateable news, links, and sponsors pages, and file uploading. Created an database-driven contact management Web application for the Indianapolis Indians database to track leads and customers. Built data entry screens and administrative panels to easily update information, generate reports, and upload relevant files. Created the ability to create users and then restrict that user’s access to certain area of the administrative area. Also made updates to the Groups Events Web application. Coded entire site in PHP, including interactive “Contribute Your Idea” section, which allows users to upload files and comments to share with others on the site. Coded entire site in PHP (minus the e-commerce section), including admininstrative site to update events, the wine list, and awards. 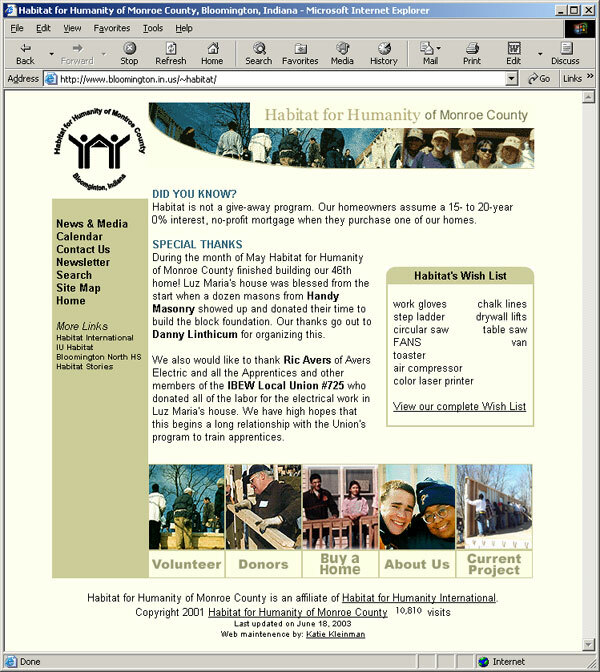 The site was nominated for a Webby in 2005. Coded entire site including random marquee images on homepage and PHP administrative section to add/edit/delete news and topics and invite a friend. 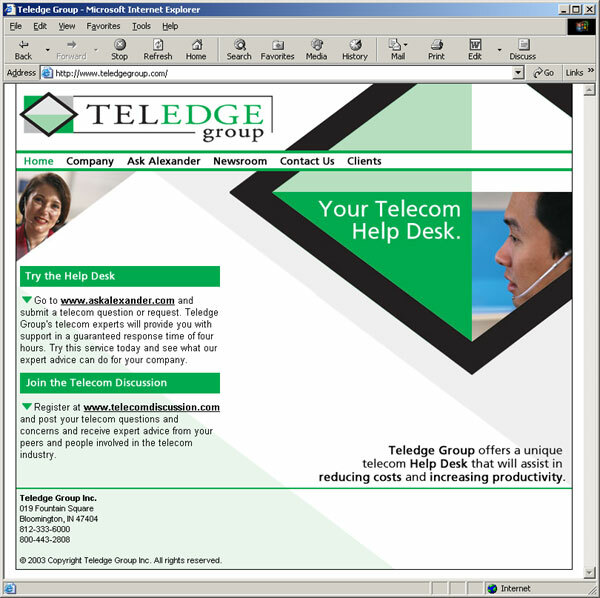 Coded portfolio section of site and wrote administrative section in ASP to add/edit/delete news, clients, and employment opportunities and handle e-mail requests. Wrote administrative section to add/edit/delete physicians from the physician directory. Co-wrote administrative site in PHP to add/edit/delete press releases, customer data, and coupons. Coded entire site, including administrative site in PHP which updates press releases, portfolio items, and uploads multiple files. Designed and coded entire site. Also reorganized and edited existing content. Coded entire site including English, German, and French Versions. Coded entire site, which is one page. Wrote upgrades in PHP to administrative site, including uploading/deleting files. Wrote administrative site in PHP to add/edit calendar, news, and courses. Coded entire site, including an ASP administrative site to add/edit calendar events and news. Coded entire site in PHP. Wrote interactive “Contribute Your Idea” section, which allows users to upload files and comments to share with others on the site. Designed and implemented interactive floor plans section in Flash. Several of these designs are from my work at Hirons & Company as a Web Designer/Developer. 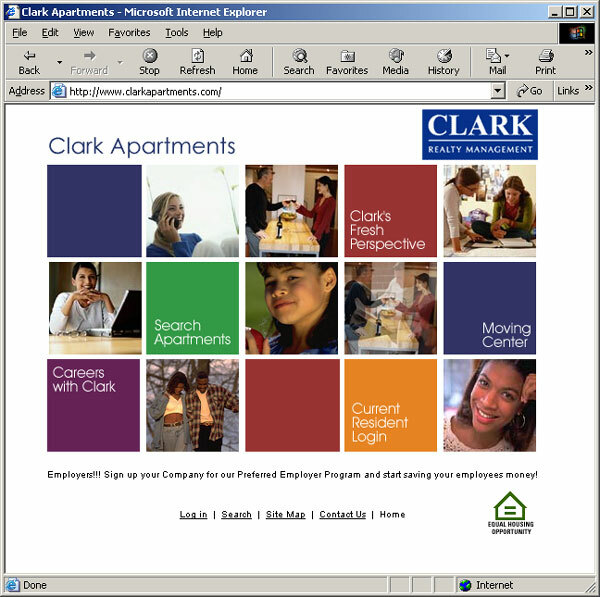 There are also many apartment community designs from my work at Resite Information Technology. Most of these sites are no longer live. 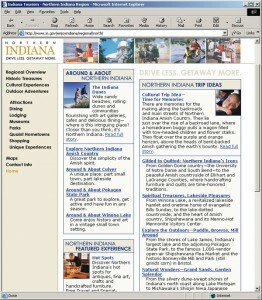 Designed and coded entire site in ASP. 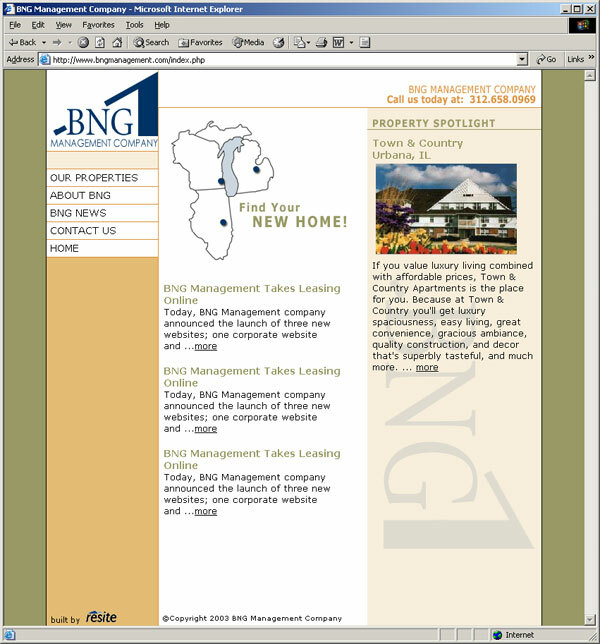 Designed and coded entire site, excluding existing forms. 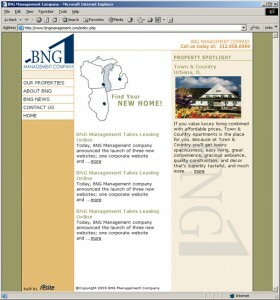 Designed and coded entire site in HTML and PHP. Designed graphic for use as a large, attention-getting Web link. Designed and coded entire site, including involvement by the Public Relations committee on the redesign. 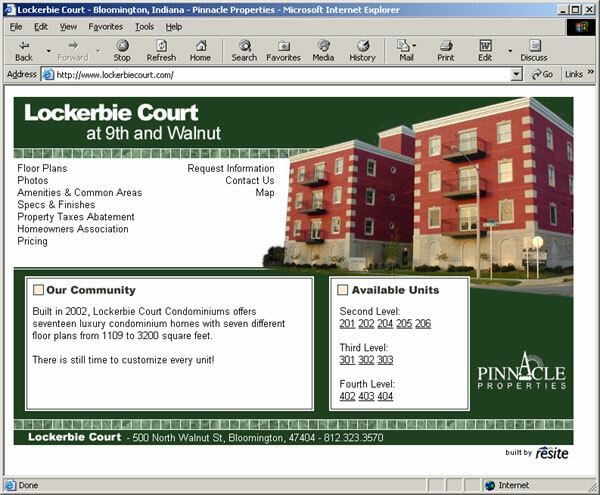 Designed and coded site, including the floor plans section in Flash. Also took photographs for floorplans sections and created a 360 degree viewer in Flash. At Ohio University I switched my major to audio production. During this time I was involved in various audio projects. The most involved during my work at wiredforbooks.org as an Audio/Visual Web Designer. I acted as post-production editor and sound designer for two audio books, Shakespeare’s Macbeth and Lewis Carroll’s Alice’s Adventures in Wonderland. I also took several classes at Ohio University in electronic music, hence the samples below. This is a mock commercial for a 30 second radio spot for Asolo boots. I wrote the advertisement and provided the voice-over. The music is by Rusted Root, used without permission. 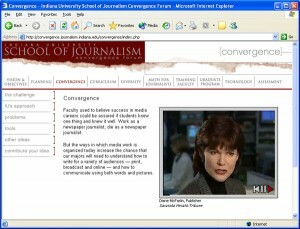 I acted as post-production editor and sound designer for this project produced by wiredforbooks.org. This is a narration of the “Wolf and the Seven Little Kids,” by Grimm’s Household Tales. I wrote the script for this project and also produced it. Voices were provided by: Brian Kleinman (Narrator), Nick Rediger (Wolf), Katie Wludyga (Mother Goat), Karen Kleinman, Katie Milliken (Youngest Goat), and Katie Miller (Miller). The music is from: The Norton Anthology of Music, used without permission. This song was put together using the audio features of Performer. The sounds were created using Galaxy. The sounds used in the “Electronic Song” composition were created in Galaxy by running sine waves through filters and oscillators. This is a composition in three parts, describing a coup d’état. It was produced using sounds created in Galaxy. This is a song that I composed and recorded using Performer. It begins with a simple melody and then it destroys itself. This is an interview with a former employee of a pizza shop and his experiences working there. This is a composition produced using Band-in-a-box and an original melody. This composition uses sound effects, two Band-in-a-Box songs, and one song created in Performer, using sounds produced with Galaxy. I tried to create the feeling of walking down Court Street on a Friday night, passing the bars and hearing the music from within. The sound effects were owned by the Ohio University Telecommunications Center. The Band-in-a-Box songs are: Latin Song and Heavy Metal Song. The song created in Performer and Galaxy is called, Electronic Song. Should Athens Build a Wal-Mart on State Street? This is a man-on-the-street report about a proposed Wal-Mart in Athens, Ohio. This was a group project. The music used is from the Saturday Nite Fever Soundtrack, used without permission. This project was created around a lot of sounds that were run through all kinds of different filters and effects. I wrote the chords for this song and then let Band-in-a-Box generate the Latin feel. I wrote the chords for this song and then let Band-in-a-Box generate the Heavy Metal feel. I wrote the chords for this song and then let Band-in-a-Box generate the national anthem feel. Created 3 animations and an interactive timeline in Flash. Also created video and audio players with preloaders in Flash. Created Flash video and audio players with preloaders.